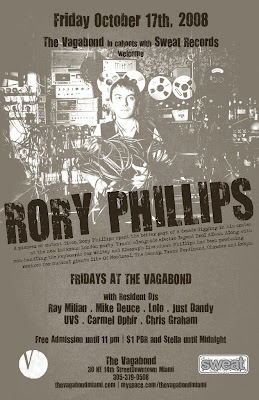 ::: Off the Radar :::: Rory Phillips @ The Vagabond Friday!! Rory Phillips @ The Vagabond Friday!! Seems like Miami has been getting a steady stream of cool shows coming through lately (Lee Burridge, Yelle, Hercules & Love Affair) All the different factions of our scene are bringing their niche artists. Some more house, some more disco, some more electro or pop and I love them all! The variety is great! Hope it's a trend that continues! This Friday (10/17) @ The Vagabond we got another one! Rory Phillips of Trash/London fame rolls into town to rock our little city. Never went to the Trash party or London for that matter :( but I have heard of the party and I think it went on for 10 yrs or so, so it must've been something special! Plus how lucky is Rory? He got to spin next to Erol Alkan every week as a co-resident! Here are some remixes he's done including a Disco Dub that's pretty hot and of the times! Can't wait to hear what he plays out! I'll be mixing it up with Rory and Mike this Friday! Expect extra craziness for this already super fun weekly! Go before 11 for complimentary admission! Plus of course the world famous $1 Stella's before Midnight! damn no wonder why they wrote "BEATIFUL ONES"